Frooition are ecommerce design experts. Working exclusively with ecommerce design for ten years, Frooition have a large, in-house design team and work with clients across the world. Frooition can offer super fast turn-round, multiple design previews, consultation with your own BigCommerce specialist designer, access to online project management software and full time support staff. Frooition create BigCommerce designs within the stencil framework, and have developed a proven template within the BigCommerce ecosystem which reduces issues, bugs and problems. 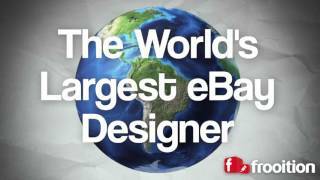 Also known worldwide for creating amazing eBay designs for some of eBay’s most successful businesses. Frooition provide great discounts when creating multi-channel designs - we pass the savings on to you. Frooition provide World Leading branding for eCommerce websites powered by the awesome Bigcommerce platform. Built to your requirements, with our expert eCommerce input, we create great looking websites that will help you grow your business. We work with you to create a beautiful Bigcommerce store that looks great regardless of the device you use. Frooition have delivered hundreds of Bigcommerce design projects and have a great knowledge of the Bigcommerce ecosystem. Our design process includes working directly with you to provide previews until you are completely happy with the design. Once you are delighted we fully instal lthe design to your store. Speak to us today and ask about our latest offers. Frooition eBay Designs are World Leading, whether you're a small seller looking for an edge over your competition or a bluechip enterprise clientm Frooition have a design service for you. Our eBay designs compliment our Bigcommerce design service perfectly, our design management software will allow sellers to push product data from eBay to Bigcommerce or Bigcommerce to eBay. Meaning any seller can quickly become a multichannel ecommerce business.